MICHAEL VAN GERWEN won a third successive Dubai Duty Free Darts Masters title with a thrilling 11-8 comeback win against Phil Taylor in Friday's final of the PDC World Series of Darts event. 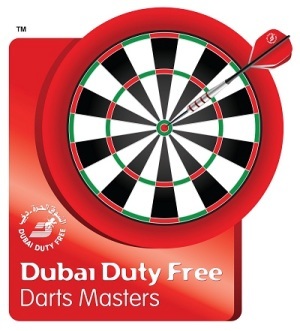 The Dutchman had claimed victory in the first two years of the tournament at the Dubai Duty Free Tennis Stadium, and battled his way to glory with a gutsy display to continue his amazing winning run. Having had to hit back from three legs down in Thursday's quarter-final against Raymond van Barneveld, van Gerwen repeated the feat before overcoming Adrian Lewis 11-9 in the semi-finals. He also trailed 8-6 against Taylor in the final, but responded superbly to surge to victory with five unanswered legs. "It's a brilliant win for me and I'm really proud," said van Gerwen. "I'm delighted because this is the hardest tournament I've had to win here, beating Raymond, Adrian and then Phil. It's been an amazing tournament, really difficult and the games were so tough so I couldn't wish for any more - every layer played well in this event. I missed a couple of chances at the beginning of the final and Phil punished me, but I stayed close and was waiting for him to make a mistake and I took advantage. To beat Phil in the final is always special and I'm really glad to win here again." Taylor had finished 125 in leg two as the opening four legs were shared, before van Gerwen edged 3-2 up on double eight and then broke for the first time by taking out 96 for an 11-dart leg. Taylor, though, replied with an 11-darter before taking out a 14-dart finish to level and checkouts of 64 and 75 to move 6-4 up with a four-leg burst before sharing the next four to retain that advantage at 8-6. However, the final turned in the next two legs as three missed doubles from Taylor allowed van Gerwen to level, before the Dutchman produced scores of 180 and 171 in a 13-darter to regain the lead at 9-8. Taylor landed a 171 in reply in the 18th leg only to miss tops as van Gerwen followed a 180 with double ten to move to the brink of a victory which he sealed by taking out 68. Taylor had booked his place in the final with a ruthless 11-3 demolition of World Champion Gary Anderson in their semi-final, before being overhauled by van Gerwen's late surge in the final. "It was in my own hands and missing darts at doubles broke my heart, but I've got to take the positives because I've not played this well before in Dubai," said Taylor. Michael's a special player, he hits the right shots at the right time and he bullies people during the game. He's a phenomenal player and I love playing him, and I think me and him are going to have a lot of battles over the next 12 months or two years because I'm playing well again and everything's coming together." World Champion Anderson had been competing in the PDC's World Series of Darts for the first time, and admitted that he had enjoyed his experience in Dubai despite his defeat to Taylor. "It's been a great event but it wasn't to be for me tonight," said Anderson. "I missed a lot of doubles but Phil banged in the 180s and 140s and hit everything. He scored well and did a good job there. I really enjoyed it and it's been amazing to be in Dubai." Lewis, meanwhile, was left to rue a third semi-final defeat in the World Series of Darts since 2013, and admitted that his missed chance to take a 9-7 lead proved the turning point. "I've really enjoyed the week and it's been a fantastic tournament," said Lewis. "Michael hit a couple of 174s at the right time which put me under the cosh and he came back well. That's probably the windiest I've ever played in on stage but I thought I did well. I'm throwing a 20 gram dart and that's going to be affected more than a 25 gram dart that Michael throws but it's one of those things."